1. Mix the oats, cinnamon and chosen milk together in a small saucepan and place on a medium heat. Stir it continuously until the mixture comes to the boil, then turn the heat down to simmer. 2. Optionally, at this stage you could warm a bowl in the oven on a low heat, so that your porridge will stay hot while you eat it. 3. Meanwhile, mash the ripe banana in a small bowl until it forms a puree with no lumps. 4. Continue to simmer and stir the oats for 5-10 minutes until it forms your preferred consistency. 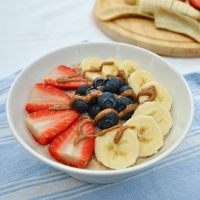 When done, remove the pan from the stove and stir in the mashed banana, then transfer the porridge into your bowl and decorate liberally with your chosen toppings.